In the course of other experiments, we serendipitously observed that extracellular nicotinamide adenine dinucleotide (NAD+) ameliorated the development of epithelial hyperpermeability when monolayers of Caco-2 enterocyte-like cells were incubated with cytomix, a mixture containing interferon-γ, interleukin-1β, and tumor necrosis factor-α. We sought to characterize the effects of NAD+ on inflammation-induced epithelial barrier dysfunction using Caco-2 monolayers that were exposed to cytomix in the absence or presence of NAD+ or other purine-containing molecules. Paracellular barrier function measured as the apical-to-basolateral passage of fluorescein isothiocyanate-conjugated dextran (mol. wt. ∼4000) was preserved in a concentration-dependent manner when immunostimulated Caco-2 cells were exposed to extracellular NAD+. 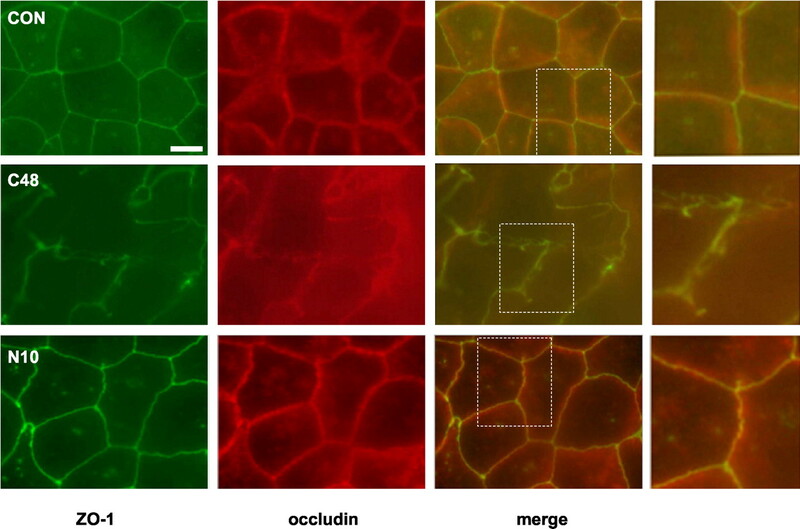 Incubation with NAD+ prevented cytomix-induced derangements in the expression and localization of the tight junction proteins occludin and zonula occludens-1 in Caco-2 cells. Treatment of cytomix-stimulated cells with NAD+ also blocked nuclear factor-κB (NF-κB) activation, inducible nitric-oxide synthase induction, and increased production of nitric oxide (NO·). Ileal mucosal permeability to fluorescein isothiocyanate-dextran mol. wt. ∼4000 was increased in mice 18 h after lipopolysaccharide (endotoxin) injection, but treatment of endotoxemic mice with NAD+ ameliorated the development of gut mucosal hyperpermeability. Thus, extracellular NAD+ seems to ameliorate inflammation-induced intestinal epithelial barrier dysfunction by inhibiting NF-κB activation and increased NO· production. A necessary function of the intestinal epithelium is the establishment of a selective barrier to allow the absorption of nutrients while restricting the uptake of toxic substances and microbes from the gut lumen. A major component of this epithelial barrier is the tight junction (TJ), a circumferential protein complex located at the apical/basolateral junction of opposing cells. The transmembrane proteins occludin and the claudin family are important TJ components that are thought to make homotypic contacts with proteins in the plasma membrane of the opposing cells (Tsukita et al., 2001). The TJ complex is believed to be the point of cell-cell contact that presents the major barrier to paracellular transport (Anderson and Van Itallie, 1995). Intestinal epithelial barrier function is compromised in a variety of inflammatory conditions, including inflammatory bowel disease, cholestasis, hemorrhagic shock, and sepsis (Unno and Fink, 1998). Many mechanisms, including activation of myosin light chain kinase and excessive NO· synthesis, have been proposed to explain the increase in paracellular permeability of intestinal epithelia after exposure to an inflammatory environment (Zolotarevsky et al., 2002; Han et al., 2003a). NO· interferes with the expression and subcellular localization of key TJ proteins, including occludin and claudin-1, and peripheral membrane components of TJs, including zonula occludens (ZO)-1, ZO-2, and ZO-3 (Han et al., 2003a). During experiments designed to explore the biological effects of decreased intracellular NAD+ content in immunostimulated human Caco-2 enterocyte-like cells (Khan et al., 2002), we serendipitously observed that adding NAD+ to the culture medium ameliorated derangements in epithelial barrier function caused by exposing these cells to a mixture of proinflammatory cytokines, called “cytomix”. This observation prompted us to review a growing literature regarding the role of NAD+ and closely related compounds as signaling molecules. Several recent studies have shown that certain cell types secrete NAD+ (Bruzzone et al., 2001; Romanello et al., 2001) and/or respond to NAD+ in the extracellular milieu (Takasawa et al., 1993a; Beers et al., 1995; Guse et al., 1995; Bruzzone et al., 2001; Romanello et al., 2001). Herein, we report that NAD+ is a signaling molecule that exhibited anti-inflammatory properties when added at micromolar concentrations to cultures of Caco-2 cells. Moreover, we present data showing that administration of NAD+ to mice ameliorated derangements in ileal mucosal barrier function induced by challenging the animals with LPS. Reagents. All chemicals were from Sigma-Aldrich (St. Louis, MO) unless otherwise noted. Recombinant human cytokines were obtained from Pierce Endogen (Rockford, IL). Animals. This research complied with regulations regarding animal care as published by the National Institutes of Health and was approved by the Institutional Animal Use and Care Committee of the University of Pittsburgh. Male 7- to 8-week-old C57Bl/6J mice weighing 20 to 25 g were from The Jackson Laboratory (Bar Harbor, ME). To induce a systemic inflammatory response, mice were injected i.p. with Escherichia coli (strain O111:B4) LPS (17 mg/kg) dissolved in 1.0 ml of PBS. Control animals (n = 6) were injected with a similar volume of PBS. Mice receiving LPS were treated with an i.v. injection (100 μl) of either PBS (n = 6) or 132 mg/kg NAD+ in PBS (n = 5) given 5 min before LPS injection, and this injection was repeated i.p. 12 h later. Groups of mice were anesthetized with 60 to 90 mg/kg sodium pentobarbital 18 h after the first injection with PBS or LPS. Segments of ileum were harvested to assess mucosal permeability to FD4 using an ex vivo everted gut sac method as described previously (Sappington et al., 2002). Cell Culture. Caco-2 human enterocyte-like cells were routinely maintained at 37°C in Dulbecco's modified Eagle's medium with 10% fetal bovine serum exactly as described previously (Han et al., 2003a). All cells were fed by changing the cell culture medium twice per week. For experiments, cells were grown on Transwell inserts (0.4-μm pore size; Costar, Cambridge, MA) and used 14 to 17 days postconfluence. Paracellular permeability of Caco-2 monolayers was measured by determining the apical-to-basal clearance of FD4 (25 mg/ml) as described previously (Han et al., 2003a). Immunoprecipitation and Western Blotting. Western blots were performed as described previously (Han et al., 2003a). Briefly, Caco-2 cells were left unstimulated or exposed to various agents. Cells were lysed in 1 ml of ice-cold NP-40 lysis buffer (25 mM HEPES, pH 7.4, 150 mM NaCl, 4 mM EDTA, 25 mM NaF, 1% NP-40, 1 mM Na3VO4, 1 mM 4-amidinobenzylsulfonyl fluoride hydrochloride, 10 μg/ml leupeptin, 10 μg/ml aprotinin), and insoluble material was collected by centrifugation and designated the NP-40 insoluble fraction. This pellet was dissolved in 100 μl of SDS buffer (25 mM HEPES, pH 7.5, 4 mM EDTA, 25 mM NaF, 1% SDS, 1 mM Na3VO4) and then diluted to 1 ml with NP-40 lysis buffer. The proteins were immunoprecipitated then subjected to Western blotting. Both steps were performed using anti-ZO-1 or anti-occludin polyclonal antibody from Zymed Laboratories (South San Francisco, CA). Horseradish peroxidase-conjugated secondary antibodies were from Jackson Immunoresearch Laboratories (West Grove, PA). Blots were developed with the enhanced chemiluminescence detection system (Amersham Biosciences Inc., Piscataway, NJ), which contains a substrate that emits light after oxidation by the antibody-conjugated peroxidase. The light emission is linear with respect to the amount of secondary antibody bound to the membrane, and the light emission is quantitated by exposing blue-light sensitive film (BioMax Film; Eastman Kodak, Rochester, NY). The images were captured using a Hewlett Packard (Palo Alto, CA) ScanJet 6300S. Immunofluorescence. All procedures were performed at 0 to 4°C as described previously (Han et al., 2003a). Caco-2 cells growing on 24-well clear Transwell inserts were fixed and stained with a mouse anti-ZO-1 mAb (BD Biosciences, Franklin Lakes, NJ) and a rabbit anti-occludin polyclonal antibody diluted 1:100. The secondary antibodies were 5 μg/ml fluorescein isothiocyanate-conjugated affinity-purified donkey anti-mouse IgG and 15 μg/ml tetramethylrhodamine B isothiocyanate-conjugated affinity-purified goat anti-rabbit IgG (Jackson Immunoresearch Laboratories). Measurement of NO· Production and iNOS Gene Expression. NO· production was measured, and reverse transcription-polymerase chain reaction for iNOS mRNA and 18S RNA were performed as described previously (Sappington et al., 2002). Relative expression of iNOS is reported after normalizing for 18S loading in Fig. 4B. 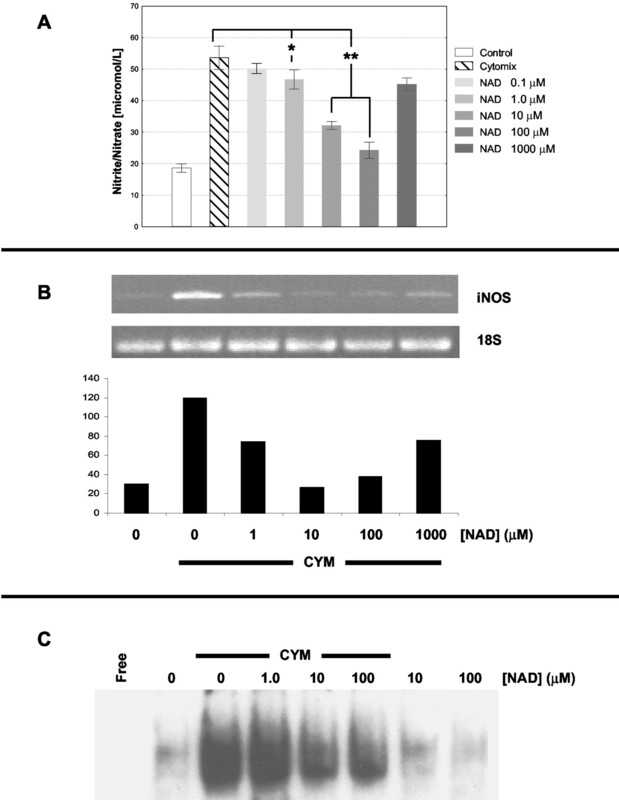 Effect of NAD+ on cytomix-induced NO· production, iNOS expression, and NF-κB activation. (A and B). Increased production of NO· and iNOS expression caused by cytomix was inhibited in a concentration-dependent manner by the addition of extracellular NAD+. (C). Nuclear extracts were prepared from the cells 4 h after exposure to the agents (cytomix and NAD+), and these extracts were used in an electrophoretic mobility shift assay using the murine NF-κB site from the κ light chain promoter. All figures are representative of four different experiments. Electrophoretic Mobility Shift Assay. Nuclear extracts were prepared and analyzed as described previously (Delude et al., 1994). However, 38.3 μl of 10% NP-40 was used, the nuclei were isolated by centrifugation at 310g for 3 min, and nuclei were resuspended in 80 μl of buffer II (20 mM Tris-HC1, pH 7.8, 5 mM MgCl, 320 mM KCl, 0.2 mM EGTA, 0.5 mM dithiothreitol). Statistical Analysis. Results are presented as means ± S.E.M. Data were analyzed using analysis of variance. p values < 0.05 were considered significant. Extracellular NAD+Preserves Intestinal Epithelial Barrier Function. Caco-2 monolayers growing on permeable supports were left untreated or exposed to cytomix (1000 U/ml interferon-γ, 10 ng/ml tumor necrosis factor-α, and 1 ng/ml interleukin-1β) for 24 or 48 h in the absence or presence of graded concentrations of NAD+ or adenosine. Paracellular permeability was determined by measuring the apical-to-basolateral flux of FD4. Epithelial permeability was unaffected when monolayers were incubated with NAD+ alone. Exposing Caco-2 cells to cytomix increased the clearance of FD4 across the monolayers (Fig. 1A). Addition of NAD+ ameliorated cytomix-induced epithelial hyperpermeability in a concentration-dependent manner. The protection afforded by 10 and 100 μM NAD+ was statistically significant. Effect of extracellular NAD+ on the permeability of Caco-2 enterocytic monolayers and mouse ileal mucosa. (A) Caco-2 cells were incubated for 24 or 48 h under control conditions or with graded concentrations (micromolar) of either NAD+ (N) or adenosine (A). Fresh NAD+ was added to the wells after 24 h. CON indicates untreated monolayers and CYM indicates cytomix was added (n = 6-12/condition). (B) Mice were injected at t = 0 h with PBS or LPS. Mice receiving LPS also received two injections of either PBS or NAD+ (132 mg/kg) dissolved in PBS. Ileal segments were harvested at t = 18 h and permeability to FD4 measured. *, p < 0.05 versus control; **, p < 0.01. NAD+ is structurally related to a nucleoside, adenosine, that is known to exert anti-inflammatory effects by binding to certain purinergic receptors (Sajjadi et al., 1996); accordingly, we considered the possibility that activation of a receptor for adenosine was responsible for the amelioration of cytokine-induced hyperpermeability by NAD+. To investigate this idea, we exposed Caco-2 monolayers to cytomix in the absence or presence of 1 to 100 μM adenosine (A in Fig. 1A). Adenosine had no effect on the induction of hyperpermeability by cytomix, suggesting that NAD+ was not simply an adenosine mimetic. We next sought to determine whether treatment with NAD+ preserves intestinal mucosal barrier function in vivo. Mice were injected i.p. with LPS (n = 11; 17 mg/kg) suspended in PBS (1 ml) or a similar volume of the PBS vehicle alone (n = 6). Ileal segments were harvested 18 h later, and an ex vivo everted gut sac technique was used to measure mucosal permeability to FD4. Some mice that were injected with LPS were also treated with two 132-mg/kg doses of NAD+ (n = 5). Other mice were injected with similar volumes of the PBS vehicle (n = 6). As expected (Sappington et al., 2003), injecting mice with LPS caused a significant increase in mucosal permeability to FD4 (Fig. 1B). Treatment with two doses of NAD+ significantly ameliorated the increase in mucosal permeability induced by LPS in mice. Extracellular NAD+Ameliorates Derangements in TJ Protein Expression and Cellular Localization Caused by Cytomix. Proinflammatory cytokines are known to alter the expression and localization of several TJ proteins in cultured intestinal epithelial cells, including occludin, claudin-1, and ZO-1 (Youakim and Ahdieh, 1999; Han et al., 2003a). We tested whether NAD+ preserves the expression and targeting of TJ proteins in cells that were exposed to cytomix. Caco-2 cells were grown in the absence or presence of cytomix or NAD+ and NP-40-insoluble protein complexes were isolated after 48 h. The insoluble complexes, which represent insoluble cytoskeletal proteins and associated TJ proteins (Sakakibara et al., 1997), were solubilized with SDS and subjected to immunoprecipitation followed by immunoblotting with anti-occludin or anti-ZO-1 antibodies. Exposure to cytomix for 48 h markedly decreased the amounts of occludin and ZO-1 present in TJs (Fig. 2A). When cells were simultaneously incubated with cytomix and 10 or 100 μM NAD+, nearly normal levels of these proteins were preserved in NP-40-insoluble complexes. Effect of extracellular NAD+ on the presence of ZO-1 and occludin in TJ complexes of Caco-2 cells. (A) Cells were either left untreated (CON) or exposed to cytomix (CYM) in the absence or presence of 10 (N10) or 100 (N100) μM NAD+ for 48 h. NP-40-insoluble protein was subjected to immunoprecipitation and Western blot analysis with an anti-ZO-1 or anti-occludin polyclonal antibody. (B) Caco-2 cells were exposed to cytomix (CYM) in the presence or absence of 10 μM adenosine (ADN). (C) Caco-2 cells were exposed to cytomix in the presence or absence of the indicated concentrations (μM) of cADPR. Western blots were repeated at least three times with reproducible results. To again exclude the possibility that NAD+ was acting as an adenosine mimetic, we prepared NP-40-insoluble extracts from Caco-2 cells that were untreated or exposed to cytomix for 48 h in the absence or presence of 10 μM adenosine. Adenosine failed to prevent the decrease in NP-40-insoluble occludin or ZO-1 in Caco-2 cells exposed to cytomix (Fig. 2B). In other systems, the signaling effects of NAD+ are dependent on its conversion to cyclic ADP-ribose (cADPR) (Deaglio et al., 2001; Okamoto and Takasawa, 2002). Therefore, we evaluated the effects of extracellular cADPR on cytomix-induced alterations in occludin expression. Coincubating cells with 10 or 100 μM cADPR preserved expression of occludin in Caco-2 cells exposed to cytomix (Fig. 2C). Remarkably, these concentrations of cADPR increased the expression of occludin to greater than baseline levels in immunostimulated Caco-2 cells. This effect of cADPR was specific for the cyclic nucleoside, because similar concentrations of (noncyclic) ADP-ribose failed to preserve occludin expression in immunostimulated Caco-2 cells (data not shown). Immunofluorescence microscopy was used to assess the structure of TJs in Caco-2 cells grown on Transwells. The cells were either left untreated (Fig. 3; CON) or exposed to cytomix for 48 h in the absence (C48) or presence (N10) of extracellular NAD+ (10 μM added at 0 and 24 h). The cells were permeabilized, fixed, and stained using fluorescein isothiocyanate- and tetramethylrhodamine B isothiocyanate-conjugated antibodies directed against ZO-1 and occludin, respectively. In control confluent Caco-2 monolayers, these proteins both were predominantly localized to regions near cell-cell boundaries. Staining was even and continuous. After treatment with cytomix, dispersed lesions occurred throughout the monolayer, in which immunostaining for ZO-1 at cell boundaries became faint, diffuse, and discontinuous. 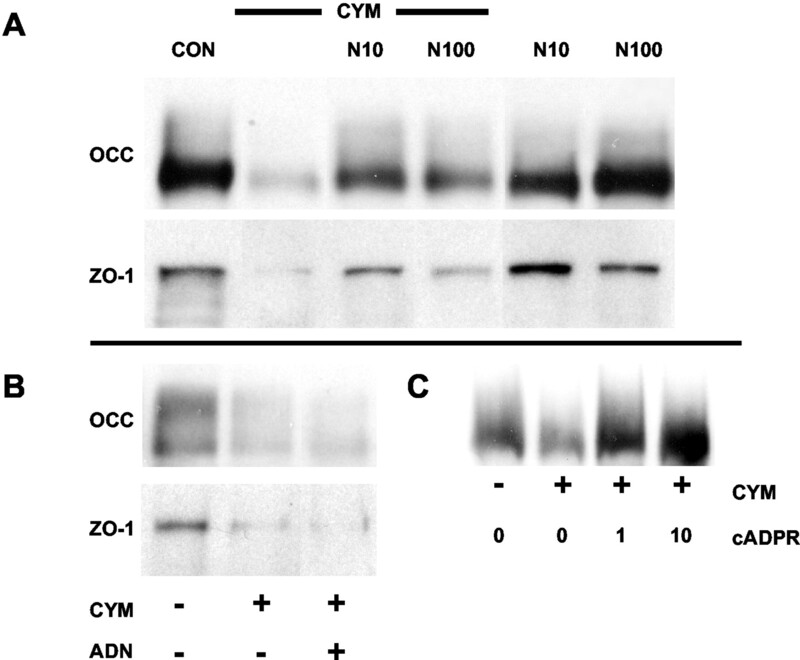 Exposure to cytomix also was associated with “ruffling” of ZO-1 and occludin immunostaining. Monolayers that were exposed to cytomix in the presence of 10 μM NAD+ showed continuous staining of ZO-1 and occludin at cell-cell boundaries. However, some ruffling of the staining pattern was still evident. Effect of NAD+ on ZO-1 (green) and occludin (red) localization in Caco-2 cells exposed to cytomix. Caco-2 cells were either left untreated (CON) or exposed to cytomix for 48 h (C48). Some cells were exposed to cytomix for 48 h and treated at 0 and 24 h with10 μM NAD+ (N10). Distribution and colocalization of ZO-1 (green) and occludin (red) was disrupted, and this was blocked by NAD+. Magnification, 1000× in the left three columns. The images in the far right column show detail of the merged images that were increased to approximately 2000× using Adobe Photoshop. Scale bar, 10 μm. Extracellular NAD+Decreases iNOS Expression in Immunostimulated Caco-2 Cells. Changes in epithelial permeability caused by exposure to proinflammatory cytokines are due, at least in part, to excessive production of NO· (Unno et al., 1995; Han et al., 2003a). Accordingly, we sought to determine whether NAD+ decreased the production of NO· (as assessed by measuring NO2- and NO3- in culture supernatants) by Caco-2 cells exposed to cytomix. As expected, cytomix increased the production of NO·, but this effect was inhibited in a concentration-dependent manner by the addition of extracellular NAD+ (Fig. 4A). Maximal inhibition was observed using 100 μM NAD+; inhibition was decreased when NAD+ was increased to 1000 μM. Cytomix increased expression of iNOS mRNA (Fig. 4B), and NAD+ blocked this effect. Again, there was a biphasic response to NAD+ treatment; 10 μM provided maximal inhibition and higher doses inhibited less well. Extracellular NAD+Inhibits the Activation of NF-κB in Immunostimulated Caco-2 Cells. iNOS induction is dependent, in part, on activation of the transcription factor NF-κB. Therefore, we tested the ability of NAD+ to inhibit DNA binding by NF-κB in Caco-2 cells exposed to cytomix. Treatment of immunostimulated cells with 1 μM NAD+ had no effect on cytomix-induced NF-κB activation, but coincubation of cells with 10 or 100 μM NAD+ clearly decreased NF-κB DNA binding (Fig. 4C) in nuclear extracts. NAD+ alone had no effect on the nuclear levels of NF-κB. NAD+ is a ubiquitous cellular constituent that is used by cells as an electron acceptor (or, in its reduced form, NADH, as an electron donor) in a variety of enzyme-catalyzed redox reactions. Accumulating data suggest that NAD+ also functions as a signaling molecule. Certain cell types secrete NAD+ (Bruzzone et al., 2001; Romanello et al., 2001) and/or respond to NAD+ in the extracellular milieu (Takasawa et al., 1993a; Beers et al., 1995; Guse et al., 1995; Bruzzone et al., 2001; Romanello et al., 2001). cADPR can enter cells through either a CD38-dependent (Franco et al., 1998) or a CD38-independent mechanism (Franco et al., 2001). The resulting increase in intracellular cADPR concentration activates ryanodine-sensitive calcium channels on endoplasmic reticulum membranes, causing the release of intracellular calcium stores to the cytoplasm (for review, see Higashida et al., 2001). Herein, we showed that extracellular NAD+ preserves intestinal epithelial barrier function when enterocyte-like Caco-2 cells are exposed to an inflammatory milieu. NAD+ modulated the decreased expression and localization of the TJ proteins ZO-1 and occludin in immunostimulated Caco-2 cells. The salutary effects of NAD+ on TJ protein expression probably explain the ability of the compound to ameliorate cytomix-induced hyperpermeability. Treatment with NAD+ decreased the nuclear translocation of NF-κB, prevented accumulation of iNOS mRNA, and decreased the production of NO· in cytomix-stimulated Caco-2 cells. Interestingly, the concentration-response relationship for NAD+ was biphasic; increasing NAD+ concentrations up to 100 μM increased the protection afforded by the compound, but 1 mM NAD+ was less effective than 100 μM. Although we can only speculate about the basis for this complex dose-response relationship, it is worth noting that 5 mM NAD+ induces apoptosis in osteoblasts (Romanello et al., 2001). Another possible explanation for this effect could be that 1 mM NAD+ inhibits extracellular NADase activity, resulting in decreased production of the second messenger cADPR (Balducci and Micossi, 2002). Another observation worth noting is that 10 μM NAD+ afforded maximal protection against decreased TJ protein expression and iNOS expression, and the 100 μM NAD+ was the most effective dose for preventing NO· production and decreased barrier function. Additional experiments will be necessary to better elucidate the dose-response relationships for the various pharmacological effects of extracellular NAD+. Together, our results suggest that NAD+ acts as an anti-inflammatory agent in cell culture, decreasing the responses of Caco-2 cells to exogenous proinflammatory cytokines. The biological relevance of these in vitro observations is emphasized by our results from in vivo studies, wherein we documented that NAD+ can act as a pharmacological agent to ameliorate alterations in gut barrier function induced by injecting mice with LPS. When Caco-2 cells were exposed to NAD+ alone, we observed an increase in the expression of ZO-1 and occludin compared with control cells (Fig. 2A). We hypothesize that NAD+ treatment of resting cells may decrease the basal production of NO·. We have previously shown that pharmacological inhibition or genetic ablation of iNOS causes increased expression of ZO-1 and occludin in ileum (Han et al., 2003b) and liver (Xiaonan Han, Mitchell P. Fink, and Russell L. Delude, unpublished observations) of mice. Together, these results suggest that basal NO· production decreases TJ proteins in epithelial cells. The ecto-NADases CD38 and CD157 cyclize extracellular NAD+ to form cADPR and nicotinamide (Deaglio et al., 2001; Okamoto and Takasawa, 2002). Both proteins are expressed by a variety of cells and may exist in soluble form in the plasma of normal humans (Deaglio et al., 2001). Whether cleavage and cyclization of NAD+ is necessary for its anti-inflammatory effects in Caco-2 cells in vitro or endotoxemic mice is unknown. This notion seems plausible, however, because we observed that extracellular cADPR, but not ADPR, preserved the expression of occludin in immunostimulated Caco-2 cells. This observation suggests, but does not prove, that extracellular NAD+ acts via the formation of cADPR as a second messenger. Intracellular and extracellular NAD+ and/or cADPR may be important in regulating intracellular calcium concentration, [Ca2+]i, in a variety of cells (Takasawa et al., 1993a; Beers et al., 1995; Guse et al., 1995; Bruzzone et al., 2001; Romanello et al., 2001). For example, cADPR-dependent changes in [Ca2+]i may be important for regulating insulin release from pancreatic β-cells in response to alterations in exogenous glucose concentration (Hedeskov, 1980). Glucose increases the intracellular concentration of ATP in β-cells. ATP, in turn, inhibits the activity of an enzyme, cADPR-glycohydrolase, that converts cADPR to ADPR (Takasawa et al., 1993b; Kato et al., 1995; Tohgo et al., 1997). Thus, according to this model, elevated glucose concentration increases intracellular cADPR concentration, leading to activation of ryanodine channels allowing the mobilization of calcium from intracellular stores. Interestingly, diabetogenic substances (e.g., streptozotocin and alloxan) are known to damage DNA, which promotes activation of the enzyme poly-(ADP ribose) polymerase (PARP). Because PARP consumes NAD+ as a substrate for poly-ADP-ribosylation, activation of PARP depletes cells of NAD+ (Takasawa et al., 1993a). Depletion of NAD+, the precursor of cADPR, inhibits signaling via this pathway. Interestingly, we have reported that cytomix induces intracellular NAD+ depletion through an NO·-dependent process in Caco-2 cells (Khan et al., 2002). Whether cytomix-induced intracellular NAD+ depletion affects intracellular cADPR levels and [Ca2+]i in Caco-2 cells remains to be investigated. Human osteoblast-like HOBIT cells differentiate into an osteoclast-like phenotype after exposure to extracellular NAD+ (Romanello et al., 2001). HOBIT cells express CD38 ADP-ribosyl cyclase activity, and NAD+ treatment increases [Ca2+]i, presumably after conversion to cADPR. Resting HOBIT cells release NAD+ into the culture medium, especially after mechanical perturbation. Because mechanical stimulation is an important factor driving osteoblast differentiation (Duncan and Turner, 1995), mechanical activation of NAD+ release by osteoblasts may be an important paracrine signal driving differentiation of these cells (Romanello et al., 2001). An important question that is not addressed by our current studies or other publications concerns the availability of extracellular NAD+ for signaling in vivo. Normal circulating levels of NAD+ are 250 ± 30 and 140 ± 10 nM in humans and mice, respectively (Kim et al., 1993). Thus, the normal circulating level of NAD+ is substantially less than the concentration required to preserve barrier function in immunostimulated Caco-2 monolayers. Thus, the effects of NAD+ reported here could be exclusively pharmacological. Alternatively, high local concentrations of NAD+ could occur in vivo when the compound is released by cells in response to normal or pathological events. It is known, for example, that fibroblasts secrete NAD+ (Bruzzone et al., 2001), and fibroblasts are intimately associated with the basal side of the intestinal epithelial sheet (Parker et al., 1974). In conclusion, NAD+ is capable of ameliorating structural and functional changes in intestinal epithelial cells induced by a proinflammatory milieu. Although NAD+ per se is unlikely to be useful as a pharmacological agent, the potent anti-inflammatory effects of this ubiquitous endogenous molecule suggest the existence of a receptor on the surface of enterocytes that could serve as a useful drug target, leading to the development of novel agents for the treatment of inflammatory conditions that affect gut epithelial function. Furthermore, our studies provide strong support for continued research into the function of NAD+ and, possibly, NAD+-derived cADPR in the function of intestinal epithelial cells during normal and pathological conditions. We thank Meaghan E. Killeen for excellent technical assistance. This work was sponsored by National Institutes of Health Grants GM58484 and GM37631. ABBREVIATIONS: TJ, tight junction; NO·, nitric oxide; ZO, zonula occludens; LPS, lipopolysaccharide; PBS, phosphate-buffered saline; FD4, fluorescein isothiocyanate-dextran mol. wt. ∼4000; iNOS, inducible nitric-oxide synthase, cADPR, cyclic adenosine diphosphate-ribose; [Ca2+]i, intracellular calcium concentration; PARP, poly(ADP ribose) polymerase. Anderson JM and Van Itallie CM (1995) Tight junctions and the molecular basis for regulation of paracellular permeability. Am J Physiol 269: G467-G475. Balducci E and Micossi LG (2002) NAD-dependent inhibition of the NAD-glycohydrolase activity in A549 cells. Mol Cell Biochem 233: 127-132. Beers KW, Chini EN, Lee HC, and Dousa TP (1995) Metabolism of cyclic ADP-ribose in opossum kidney renal epithelial cells. Am J Physiol 268: C741-C746. Bruzzone S, Franco L, Guida L, Zocchi E, Contini P, Bisso A, Usai C, and De Flora A (2001) A self-restricted CD38-connexin 43 cross-talk affects NAD+ and cyclic ADP-ribose metabolism and regulates intracellular calcium in 3T3 fibroblasts. J Biol Chem 276: 48300-48308. Deaglio S, Mehta K, and Malavasi F (2001) Human CD38: a (r)evolutionary story of enzymes and receptors. Leuk Res 25: 1-12. Delude RL, Fenton MJ, Savedra R Jr, Perera PY, Vogel SN, Thieringer R, and Golenbock DT (1994) CD14-mediated translocation of nuclear factor-kappa B induced by lipopolysaccharide does not require tyrosine kinase activity. J Biol Chem 269: 22253-22260. Duncan RL and Turner CH (1995) Mechanotransduction and the functional response of bone to mechanical strain. Calcif Tissue Int 57: 344-358. Franco L, Guida L, Bruzzone S, Zocchi E, Usai C, and De Flora A (1998) The transmembrane glycoprotein CD38 is a catalytically active transporter responsible for generation and influx of the second messenger cyclic ADP-ribose across membranes. FASEB J 12: 1507-1520. Franco L, Zocchi E, Usai C, Guida L, Bruzzone S, Costa A, and De Flora A (2001) Paracrine roles of NAD+ and cyclic ADP-ribose in increasing intracellular calcium and enhancing cell proliferation of 3T3 fibroblasts. J Biol Chem 276: 21642-21648. Guse AH, da Silva CP, Emmrich F, Ashamu GA, Potter, BV, and Mayr GW (1995) Characterization of cyclic adenosine diphosphate-ribose-induced Ca2+ release in T lymphocyte cell lines. J Immunol 155: 3353-3359. Han X, Fink MP, and Delude RL (2003a) Proinflammatory cytokines cause NO-dependent and independent changes in expression and localization of tight junction proteins in intestinal epithelial cells. Shock 19: 229-237. Han X, Fink MP, Uchiyama T, Yang R, and Delude RL (2003b) Increased iNOS activity is essential for the development of hepatic epithelial tight junction dysfunction in endotoxemic mice. Am J Physiol Gastrointest Liver Physiol, in press. DOI: 10.1152/ajpgi.00231.2003. Hedeskov CJ (1980) Mechanism of glucose-induced insulin secretion. Physiol Rev 60: 442-509. Higashida H, Hashii M, Yokoyama S, Hoshi N, Chen XL, Egorova A, Noda M, and Zhang JS (2001) Cyclic ADP-ribose as a second messenger revisited from a new aspect of signal transduction from receptors to ADP-ribosyl cyclase. Pharmacol Ther 90: 283-296. Kato I, Takasawa S, Akabane A, Tanaka O, Abe H, Takamura T, Suzuki Y, Nata K, Yonekura H, Yoshimoto T, et al. (1995) Regulatory role of CD38 (ADP-ribosyl cyclase/cyclic ADP-ribose hydrolase) in insulin secretion by glucose in pancreatic beta cells. Enhanced insulin secretion in CD38-expressing transgenic mice. J Biol Chem 270: 30045-30050. Khan AU, Delude RL, Han YY, Sappington PL, Han X, Carcillo JA, and Fink MP (2002) Liposomal NAD+ prevents diminished O2 consumption by immunostimulated Caco-2 cells. Am J Physiol 282: L1082-L1091. Kim UH, Kim MK, Kim JS, Han MK, Park BH, and Kim HR (1993) Purification and characterization of NAD glycohydrolase from rabbit erythrocytes. Arch Biochem Biophys 305: 147-152. Okamoto H and Takasawa S (2002) Recent advances in the Okamoto model: the CD38-cyclic ADP-ribose signal system and the regenerating gene protein (Reg)-Reg receptor system in beta-cells. Diabetes Suppl 3: S462-S473. Parker FG, Barnes EN, and Kaye GI (1974) The pericryptal fibroblast sheath. IV. Replication, migration and differentiation of the subepithelial fibroblasts of the crypt and villus of the rabbit jejunum. Gastroenterology 67: 607-621. Romanello M, Padoan M, Franco L, Veronesi V, Moro L, and D'Andrea P (2001) Extracellular NAD+ induces calcium signaling and apoptosis in human osteoblastic cells. Biochem Biophys Res Commun 285: 1226-1231. Sajjadi FG, Takabayashi K, Foster AC, Domingo RC, and Firestein GS (1996) Inhibition of TNF-alpha expression by adenosine: role of A3 adenosine receptors. J Immunol 156: 3435-3442. Sappington PL, Han X, Yang R, Delude RL, and Fink MP (2003) Ethyl pyruvate ameliorates intestinal epithelial barrier dysfunction in endotoxemic mice and immunostimulated caco-2 enterocytic monolayers. J Pharmacol Exp Ther 304: 464-476. Sappington PL, Yang R, Yang H, Tracey KJ, Delude RL, and Fink MP (2002) HMGB1 B box increases the permeability of Caco-2 enterocytic monolayers and impairs intestinal barrier function in mice. Gastroenterology 123: 790-802. Takasawa S, Nata K, Yonekura H, and Okamoto H (1993a) Cyclic ADP-ribose in insulin secretion from pancreatic beta cells. Science (Wash DC) 259: 370-373. Takasawa S, Tohgo A, Noguchi N, Koguma T, Nata K, Sugimoto T, Yonekura H, and Okamoto H (1993b) Synthesis and hydrolysis of cyclic ADP-ribose by human leukocyte antigen CD38 and inhibition of the hydrolysis by ATP. J Biol Chem 268: 26052-26054. Tohgo A, Munakata H, Takasawa S, Nata K, Akiyama T, Hayashi N, and Okamoto H (1997) Lysine 129 of CD38 (ADP-ribosyl cyclase/cyclic ADP-ribose hydrolase) participates in the binding of ATP to inhibit the cyclic ADP-ribose hydrolase. J Biol Chem 272: 3879-3882. Tsukita S, Furuse M, and Itoh M (2001) Multifunctional strands in tight junctions. Nat Rev Mol Cell Biol 2: 285-293. Unno N and Fink MP (1998) Intestinal epithelial hyperpermeability. Mechanisms and relevance to disease. Gastroenterol Clin North Am 27: 289-307. Unno N, Menconi MJ, Smith M, and Fink MP (1995) Nitric oxide mediates interferon-gamma-induced hyperpermeability in cultured human intestinal epithelial monolayers. Crit Care Med 23: 1170-1176. Youakim A and Ahdieh M (1999) Interferon-gamma decreases barrier function in T84 cells by reducing ZO-1 levels and disrupting apical actin. Am J Physiol 276: G1279-G1288. Zolotarevsky Y, Hecht G, Koutsouris A, Gonzalez DE, Quan C, Tom J, Mrsny RJ, and Turner JR (2002) A membrane-permeant peptide that inhibits MLC kinase restores barrier function in in vitro models of intestinal disease. Gastroenterology 123: 163-172.